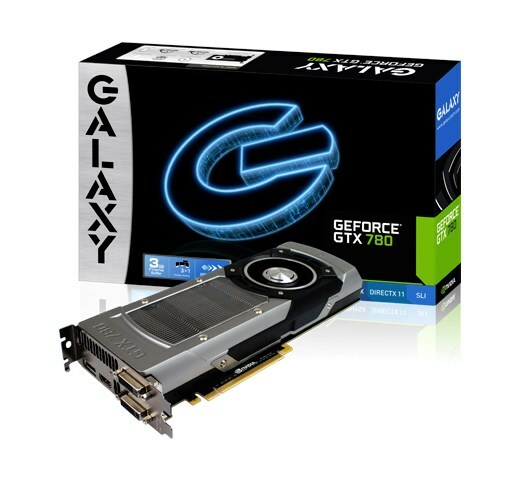 Galaxy shows off its GeForce GTX 780. Nothing special to see here though, it's a reference-based card. Galaxy Microsystems, a leading manufacturer of the world’s best performing NVIDIA graphics cards, announced today the Galaxy GeForce GTX 780, built with latest generation of the NVIDIA Kepler GPU featuring 3GB of GDDR5 and a staggering 2304 cores—50% more than its predecessor. The GTX 780 leverages this raw power with GPU Boost 2.0, which dynamically increases clock speeds while allowing greater customization and overclocking options. Gamers can set temperature targets, adjust fan controls, and take advantage of extra overvoltage headroom along with optimizations for water-cooling solutions to push performance to the absolute maximum. Great performance needs an equally impressive cooling solution, and the GTX 780 sets a new standard with a whisper quiet experience—just 32dB—even during the heaviest use. The full amassment of gameplay enhancing graphics technologies is here as well, including support for Microsoft DirectX 11.1, NVIDIA 3D Vision Surround, TXAA, Adaptive Vertical Sync, and PhysX. Gamers can combine up to three cards in SLI on capable systems to further increase performance to as much as triple that of a single GPU.